Moving and learning and feeling the fresh air in your lungs. Is there anything better? I have been watching a couple of the kids in my class when they go outside. They immediately take a deep breath and then run out to play. Some kids just need to be outside. How can we bring the classroom outdoors? I just finished reading Richard Louv's Last Child in the Woods (upcoming #pypchat book club). I love the sentiment and main idea of the book. We need to connect and explore with the outdoors more. There is a synthesis here with the work Gregory Bateson in Mind and Nature: A Necessary Unity, who argues that our thought process should mirror the complexities of nature, and the problems of our world result from a disconnect between the way our mind works, and the way nature works (warning: not an easy read if you are not into philosophy and epistemology). He is right that we need to focus on the beautiful side of nature and evoke a sense of awe and wonder. This topic is not a new one, people have been arguing for the decades about a need to improve Ecological Literacy. Check out the Center for Ecoliteracy. Great resources, books, and overall philosophy. I always love reading posts by +Cristina Milos (@surreallyno). Always thoughtful and well written. 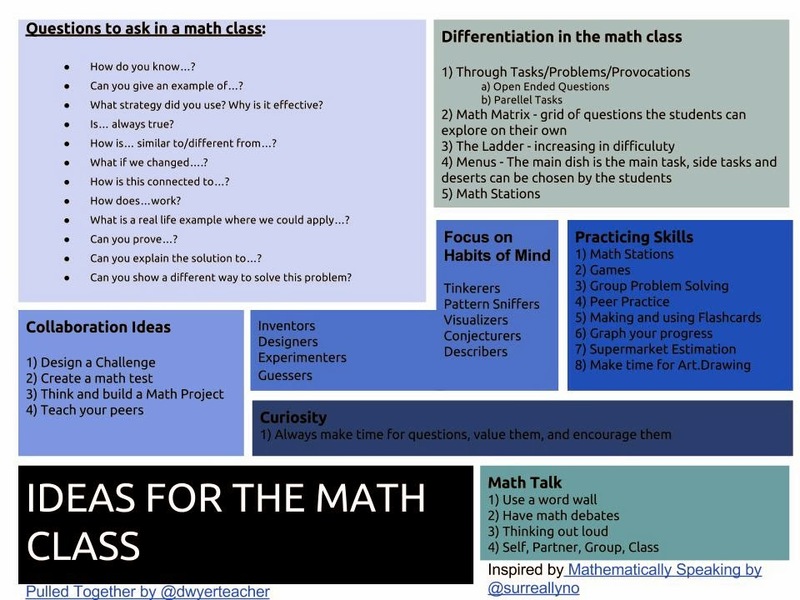 A while back she posted "Mathematically Speaking", which outlined a bunch of ideas for the math classroom. I have had this on my TO DO list for a couple of weeks now, but I finally got around to visualizing it. It is nothing fancy, just lists of ideas, but it all fits on one page, with my own ideas added in. I will be sticking it on the wall next to my desk at school, hopefully to give me ideas when planning engagements. Up until the end of the Edo period in ancient Japan, the year was broken down into 24 seasons based on the phases of the moon and swelling of the tides. Life was simpler back then, work in the fields, harvest the crops, buying and selling of goods in the marketplace, etc. The calender helped put people in constant contact with the nature that surrounded them, and acutely aware of its subtleties. The mountains, the sea, the rice fields. People noticed small differences in their environment, small alterations in the surroundings. They must have been incredibly tuned in, and sensitive to the world outside their doors. After all, they depended on that harmony with nature to live their lives. Not only were they aware of the small changes, they celebrated them and brought them to the attention of the entire community. Finding the first worm of the season might have been a badge of honour. I have been disengaged lately. Maybe it is the time of the year, maybe it is living in a new place with new routines, or maybe it is that I feel more tired with a much larger, more energetic class than I have previously had. Yet, I also have been feeling overwhelmed with the amount of information out there. Twitter, Google+, email correspondence, books, blogs, journals, resources, etc. The problem is not that there are so many bad ideas, the problem is that there are so many good ideas. So many positive ways to get to the deeper learning that interests me.